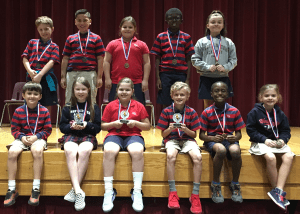 On Tuesday, February 5, our third grade competed in their spelling bee. Well‐prepared and excited, the students showed their spelling expertise. After 17 rounds of intense competition, Greta Harms won the spelling bee. Words spelled correctly that led to the final round were “axis,” “creatures,” and “knelt.” Kate Hajduk came in second place, and Drew Barbar won third place.